Moving on from the fact that Iris apparently cannot crossover without causing a cataclysmic event, now we look at how Iris is treated compared to the white women she’s surrounded with. What becomes obvious pretty quickly is that even though The Flash has a Black woman as the romantic heroine of the story, the people who write the crossovers would rather showcase all the white women as integral to the stories. Curiously enough, there were no complaints that scenes of Lois taking part in the action were “forced.” But I don’t suppose that’s any of my business. This latest crossover, for example, was blatantly, almost painfully explicit in how the Arrowverse likes to exclude Iris. 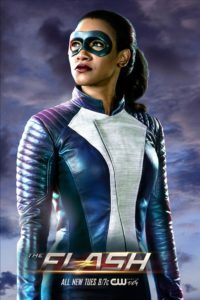 As mentioned, while Iris was the centre of the first episode in The Flash, she wasn’t allowed to cross over and see the fallout of the actions on the other shows. Though she didn’t do much other than dispense relationship advice and fall over throughout all three episodes of the crossover, The Flash writers saw fit to include a scene between Lois and Caitlin meeting, but not Lois and Iris, who would presumably have more to talk about. But it’s Lois herself that really cinches it, because the two women presumably have the same skillset, yet one was treated with far more respect than the other. I say “presumably,” because we have only known Lois for two episodes, yet she got more to do in her first crossover than Iris did in her five years. She got to have a conversation about her job with another woman – even though it didn’t actually have any bearing on the plot – had cute banter with her boyfriend, teamed up with said boyfriend, got to have a hero moment, got pregnant, and got proposed to. She was emphasised as a human woman who didn’t need powers to be a hero, because her heart was enough for not only the hero himself, but to save the day. But, again, this is a problem that goes back to the very first crossover and the Arrowverse’s white feminism. Which we have talked about. Extensively. This still is from an earlier episode, but it’s essentially the only thing Patty did during the second crossover. In the first, Iris doesn’t know that Barry is The Flash, and Felicity, from a completely different show, gets more screen time than she does, because the writers couldn’t be bothered to give her something to do that would develop her as a character. In the second, as I mentioned, she only had one line. This, despite the fact that Iris had a dead mother come back to life and a dead brother she was keeping secret – yet, we couldn’t even get one short aside about it. Instead, the stories that were considered of utmost importance were Oliver and Felicity’s baby drama, and Patty Spivot (Shantel VanSanten) bursting into a room and shooting a man because reasons. During the third, the only thing Iris got to do was randomly decide she didn’t want her brother to be a hero. Meanwhile, Felicity got to interact with every single one of the heroes, go up in a spaceship, travel back in time, and take part in the victory drinks at the end. Caitlin’s Killer Frost arc had some recognition in this one, and she got to vent her problems to a trusted friend and also hang out with the heroes. I already recapped how whoever wrote this one ignored every opportunity for Iris to have something to do, so I won’t repeat myself. During the fourth, Iris’ wedding is hijacked by Nazis. Not only does she barely get to voice how she feels about it, she then has to spend the rest of the episode holding Felicity’s hand through her relationship troubles with Oliver, not receiving any of the same kind of care in return. #ElseworldsSoWhite, like I said, needs context for clarity, and it exists in the context of Iris getting less to do when she is allowed to crossover (which was once) and/or treated as an afterthought even when she remains on her own show…but the white women aren’t. Why is it that great care was taken to show Lois as a well-rounded character who connected with each of the superheroes, but Iris never has been? Why is it that writers of other shows always make the effort to include places for others’ skillsets, but outright ignore Iris’ when they do it by accident? And why in God’s name was it a bigger priority for Lois Lane to meet and talk to Caitlin Snow over Iris West, who not only has the same job that she does, but ranks right up there with Lois herself in terms of superhero love interests? Moreover, the idea that these characters require some sort of specialised skill to go on adventures is ridiculous. One of the most popular excuses for Iris not joining in is that she’s not a super genius or a superhero. Once I’ve gotten over the fact that it’s a grown adult saying these words and not a lisping toddler, I have to laugh. Because quite apart from the Arrowverse regularly glossing over places in which Iris could shine, the idea that one needs to have an impossible level of intelligence or super powers is at once elitist and stupid. There are plenty of ways to write in a character like Iris getting involved in the story without suspending too much disbelief and still emphasising her heroic spirit. They literally just did it with Lois. Iris in the suit brought a lot of excitement, so I can’t really believe that she isn’t a big draw. There is no reason they couldn’t have written Iris into any of the stories, so feeble waffling about “space” makes no sense. In fact, I find it hard to locate a reason that does make sense. This crossover, for example, saw some of the characters as alternate versions of themselves – was there worry that Patton did not have experience with that? That can’t be it, because she is actually tied in second place with Gustin and John Wesley Shipp for most alternate versions of their characters played (Tom Cavanaugh is in first place). Do the producers see her as untalented? Perhaps, but that would be odd given that again, like Gustin, she’s the only one on the show to win an award for her acting. Maybe they think Iris as a character is unpopular? This I can’t believe, as the Arrowverse ran a whole crossover based around her and Barry getting married, and one only needs to point to the excitement that happened when a picture of Iris in her suit was released. I want to be very clear, I feel incredibly stupid grabbing around in the dark for reasons that the Black woman just so happens to not cross over but the white women always get to. Of course, there is more to an actor’s career and a character’s strength than screen time and popularity. Because the truth is, there is no reason. No good reason, anyway. As Ladies With Gumption pointed out, all it comes down to is who they want to pay, and it just so happens that the white women always get that extra pay cheque when November rolls around.